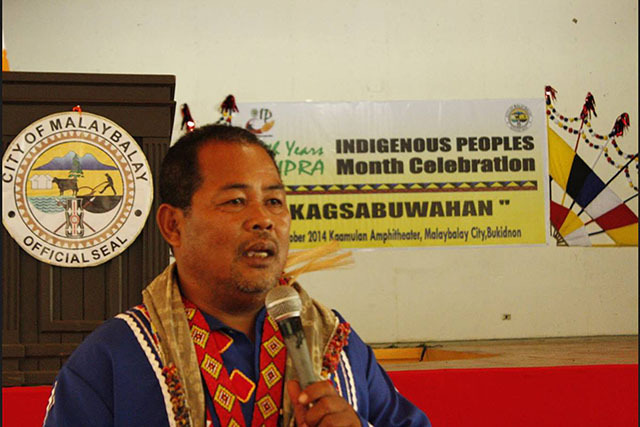 MALAYBALAY CITY (MindaNews / 18 May) – Slain Umayamnon tribal leader Datu Benjamin Omao was the first ever selected to be the indigenous people’s mandatory representative in the history of the Malaybalay City Council. 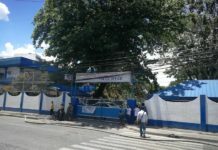 As part of the preparations for legislation, he consulted mandatory representatives from the city’s 46 barangays in 2012 to arrive at an eight-point legislative agenda of the indigenous peoples in the city. Omao, an Umayamnon based in Miglamin village, said the eight points were “equally important” but the most crucial “at the moment” is for the IPs to build a strong indigenous political structure. Omao was killed by still unidentified assailants in his office around 8:30 a.m. Monday while he was meeting a fellow IP mandatory representative from Aglayan village. Police report as of May 18 identified IP representative Thelma Sarento, 62, and Omao’s aide Samuel Talucdo, 48, who were with him in the meeting. Both were reported to be hurt in the incident – Sarento in her left hand and Talucdo in his right foot. 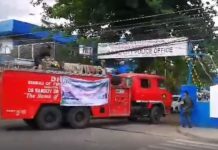 Omao died right away while the two injured were brought to the Malaybalay Polymedic General Hospital, police said. Datu Richard Macas, IP mandatory representative to the Bukidnon provincial board, said Omao’s death leaves a vacuum in the city council. It will take some time for the city’s 46 IP mandatory representatives to convene and select his replacement. In an interview after his selection in 2012, Omao said the IP mandatory representatives to the local legislative bodies are important for the local government so they can include the IP agenda. In coming out with the “Lumad agenda”, his office consulted IP leaders in their areas, including IPs who have become professionals, and the academe. For the city, he had to present the final draft of the IP agenda to the city council. But for Omao, there was no need for city councilors to debate on it as it is the IPs’ agenda. Omao said the political agenda covers the capability building needed for the tribal elders and leaders of the indigenous political structures and indigenous people’s organizations in accordance with policies provided by the National Commission on Indigenous Peoples (NCIP). He said strengthening the IPs’ political systems is important, especially because Lumads are subjected to exploitation by political leaders. “They divide the IP communities by choosing their own pet tribal leaders without recognizing those selected through traditional means,” Omao added in the interview at the Bukidnon Institute of Catechetic in Malaybalay City. He said the timing was ripe then to strengthen the IPs’ political systems because of the then upcoming 2013 elections. According to a copy of his legislative agenda, the political issues also include strengthening of the IP tribunal system in customary process of conflict transformation, enforcement of tribal jurisprudence and customary laws. The pigsaligans, or the mandatory representatives to the local councils, have to go through capacity-building, too, he added. The Lumad leader also pointed out the need to create a grievance council to help address IP concerns. Among the basic component of the political agenda is to strengthen IP family relations through solemnization of tribal marriages, he added. Omao said the promotion of welfare and well-being of IP communities is also a paramount agenda for IP leaders to push in local governance. He cited nine target interventions in the agenda, including capability-building for entrepreneurial management, livelihood and development, promotions and marketing of IP products. The other interventions include indigenous crafts development, promotions and marketing; communal livelihood program; and livelihood programs for IP women. Omao also included community-based eco-tourism program; sustainable and responsible use or extraction of natural resources in accordance with existing laws and guidelines of the state, and customs, traditions and policies of the Lumads. Omao said the bagsakan is foremost because local farmers are exploited as to the pricing of their produce in neighboring Cagayan de Oro City, where their products are brought from the farms. His legislative agenda also covered integrity of the IP culture, access to quality education that does not endanger the integrity of the IP culture; the protection, conservation and rehabilitation of the environment for a balanced ecology; secured ownership of ancestral domains and lands; access to basic services that are responsive to the needs and sensitive to the culture of the Lumads; and maintenance of peace and security in IP territories and communities. He also pushed for the establishment of the IP college in Upper Pulangi area, the city’s remote district at its border with Agusan del Sur. That year, in 2012, the province of Bukidnon was known to be the first in the country to have selected complete mandatory representatives at the municipal and city levels and a provincial representative in the person of Datu Salimbungan Mayda Pandian. Pandian died of illness last year. Omao also tried to clarify his ancestors’ decision in relating to conquerors even as he said present day commemoration of the foundation of towns in Bukidnon lacked “sense of history” and understanding of the people who built the place as a settlement before colonizers arrived. He said it should not be viewed as a surrender of their heritage and identity. “If there is no peace and order, there won’t be real progress, development,” he said. Omao said the city government, too, should manifest its vision for the Lumad in the city, including how to promote respect of their culture and customary laws. “Foremost, there has to be recognition of the Lumad’s ancestral domain,” he said, as the Lumad are the “owners” of Malaybalay. The datu said the city government must help the Lumad restore their economic system, particularly the indigenous farming system as against the synthetic farming brought by outsiders. Omao said the value of looking at history lies in its implications on the city’s present day peace and order situation.